Photo credit is Brittany Kallstrom Photography. Brace yourself for Silent Line; they produce heavy and melodic music with an orchestral flair rooted in death metal. The band hails from Bonnyville, Alberta, and the members decided to step outside of their small town trappings — they wanted to continue to create aggressive music and play live. 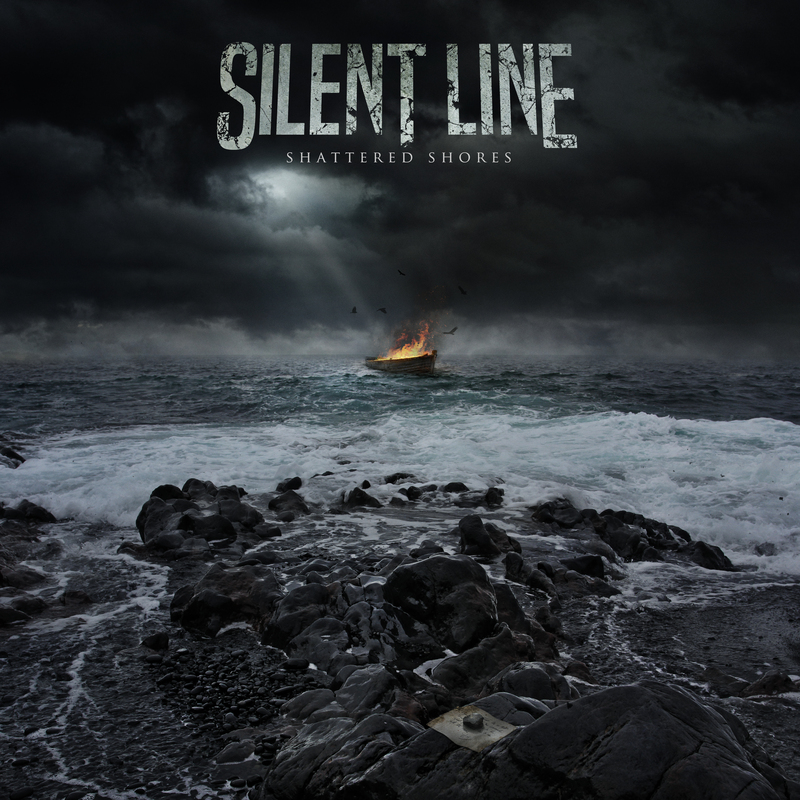 The members of Silent Line have been friends since high school, and that has allowed them to collaborate on writing and composing their signature brand of death-infused melodic metal seamlessly over the years. Their previous album, ‘Born of A Dying Star’ led them to discover their true sound and refine it so that the music that they create now embodies what they have envisioned. Their dedication to their craft is strengthened by their loyal fans, who have supported their development over the years. The band is composed of Mike Burton leading the charge on guitar and vocals, Randy Bergh writing pummeling guitar riffs, Andy Sidloski crafting driving bass lines, and Adam Kallstrom thundering on drums. The line up charges audiences with their energy and fills the entire room with its symphonious melodies. 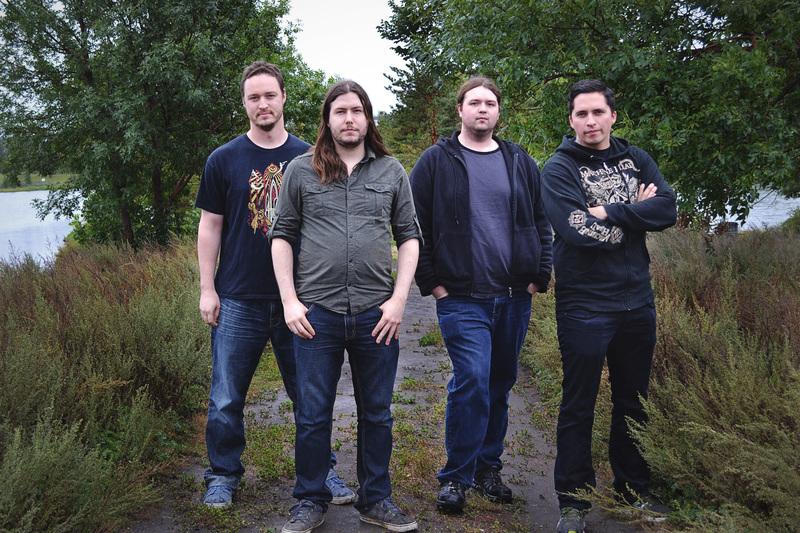 They are releasing their 2015 full-length ‘Shattered Shores’, which happens to be a concept album. The title track is split into two parts, and throughout the album several thematic riffs and lyrics are repeated, creating a motif for listeners. The title references being stranded and trapped forever as the shores become more eroded and the reality of isolation sets in. The lyrics revolve around the themes of overcoming hardships, anxiety, and “weathering the storm” in order to persevere. A single person is referred to throughout the album and everything is told from their point of view as they wander, stuck on the island — unsure of how they got there, and unsure if they will ever leave. The band is planning to unleash this album Friday, October 30, 2015 to metal fans across the globe who want to share in the experience that ‘Shattered Shores’ has in store. For more information please visit https://www.facebook.com/silentlinemetal. “Shattered Shores” is a concept album – our first attempt at one – that depicts a tortured island stuck in time being slowly worn away by an endless ocean. Themes of frost, snow, fire, night, and stars are used to illustrate feelings of hopelessness, fear, and loss. A single person is referred to throughout the album and everything is told from their point of view as they wander, stuck on the island unsure of how they got there, and unsure if they will ever leave. Lots of references to snow and frost are used as we live in Canada, and there is a lonely but beautiful character to the long winter we experience. Another recurring theme is the storm, which brings change and renewal; it is – for lack of a better term – the symbol of hope and of a brighter future. Overall, Shattered Shores has a melancholic feel to it. It is definitely darker than our other albums, but we feel that it is much more mature and identifiable with an audience. It’s not meant to be depressing, but it deals with real issues and lots of the time those are not pretty. While it is a darker album, the message is not. Overcoming internal issues and feelings is the prime focus, and to describe how important that is, it is necessary to spend time describing the more pessimistic side of things and what makes it so crippling. The songs are more involving and deeper in meaning and structure than our last release, and we took a step back technically on purpose. Individually, the instruments are not as “crazy” as before, but we had a vision for the songs this time, we could see the end product and knew that to get there we didn’t have to play the most technically demanding things as fast as we could. The songs, while more simple, have far more feeling and emotion than before and we are very proud of what we have produced. We hope that everyone listening to the album can find something they enjoy, something they identify with, and something that makes them want to continue listening. The opening song of the album starts with the sounds of wind and ocean waves, leading into a large, orchestrated introduction. When the song picks up, it hits you right in the face and doesn’t stop until the last note ends. This song is used to set the mood of the album both lyrically and musically, as it shows new aspects of our music like blastbeats, orchestrations, clean vocals, and more-simple, but catchier guitar riffs. Lyrically, this song describes the crumbling land and the uncertain future, as well as the forgotten past. The person being lost inside the seemingly endless night has now become most comfortable in the dark, unable to find their way back home even if they wanted to. This song is more “bouncy” and is a lot different from the opening track both lyrically and musically. The bounciness comes from locking the rhythm guitars to the kick drum in verses and blending lead guitar and synth runs together. In this song, the setting is one of the land free of snow, being burned away by an inferno; fear dominates. The past and how the land has come to be a ruined hellscape is the main subject matter. This is the transition into winter after the inferno in the last song. Primarily dealing with the passage of time and fading memories, the lyrics describe a person longing to remember better times. Longing as well for a simpler time when things were seen as black or white: simple and clear choices that do not truly exist. Complex shades of grey have become reality. A lead guitar laden intro moves into a percussive verse featuring mainly drums and bass underneath the vocals. There isn’t a very complex structure to the song, but as with lots of the album it is the feeling that matters, not the amount of notes or changes in time signature. The first part of the title track of the album, it describes the coming of the storm that is supposed to wash away the ash of the past and renew the land. It shares a similar chorus with Shattered Shores II: A New Beginning, as well as the verse riff – although the songs are in different tunings. It also shares some lyrics with Erosion to tie the depiction of ashes and flames to the storm. It primarily describes hopelessness and sorrow, trying to move on but being stuck in depression. Musically it is quite diverse ranging from classic In Flames-style dual lead guitars to a four guitar harmonized clean bridge and huge ringing chords. The song’s lyrics first describe acceptance of the end as laid out before; wandering alone in endless night and snowy wastelands, uncertain of anything but hopelessness. But by the end, there is a sign that change is in the air. The frost and snow has given way to spring, and the storm has melted the last of the snow. This is the direction we always wanted to head in: blending harsh vocals and fast sections with acoustic guitar, synth, and clean vocals to give a more dynamic sound. One of the most diverse songs on the album ranging from an acoustic intro to synth lead over polyrhythms, laid back verses, time changes, and a chorus with nearly ten vocal layers. We all need reminders in dark times there are going to be better days ahead, and to try and avoid becoming accustomed to negativity and the darkness; wishing that even the stars would go out so that there would be no need to even hope for light. One of the more fast paced and brutal songs on the album, it has minimalistic verses to make the choruses sound even larger. The second part of the album’s title track deals with coming to terms with the past and trying to move forward. The past is burned to ash and the storm washes it all away, leaving only the present and the future. However, the present is just another version of hopelessness, wearing away the endless days watching the ocean with no control over life. It’s our longest song, clocking in just over 8 minutes, it contains a little bit of everything and is an experiment in combining orchestrations and synths over heavy passages. It shouldn’t feel like 8 minutes by the end, there is a lot of variation and several time changes to keep things fresh. Into the Chasm could be described as the person remembering what led the land to become ruined and barren, feeling deserving of the fate through past actions of greed and deceit. Another experiment in combining orchestrations with synthesizers, this is also the only song on the album written in triplet time. The second song on the album with an extended orchestrated intro, The Faceless Shadow in the song is a reference to our fears and self-doubt; in the concept as a whole it is an actual physical manifestation of these negative thoughts: a malicious entity and antagonist. The song ranges from fast double kick passages to an acapella vocal break with a few time changes in there to keep it fresh. The closing song with an appropriate title, it is about not being afraid of the future. There is always hope, even if something familiar must end to initiate the change required. The message of the song is to overcome the fear we all have of inadequacy and failure.